Yesterday, Curbed LA broke the news that the Army Corps of Engineers had finally released their much anticipated Los Angeles River Restoration study. The report indicates that "Alternative 13," otherwise known as the Arbor Corridor Extension (ACE), is the tentative recommendation for the project. So now that the Corps of Engineers has established a path forward, let's see what $453 million gets us. First, some specifics on Alternative 13. 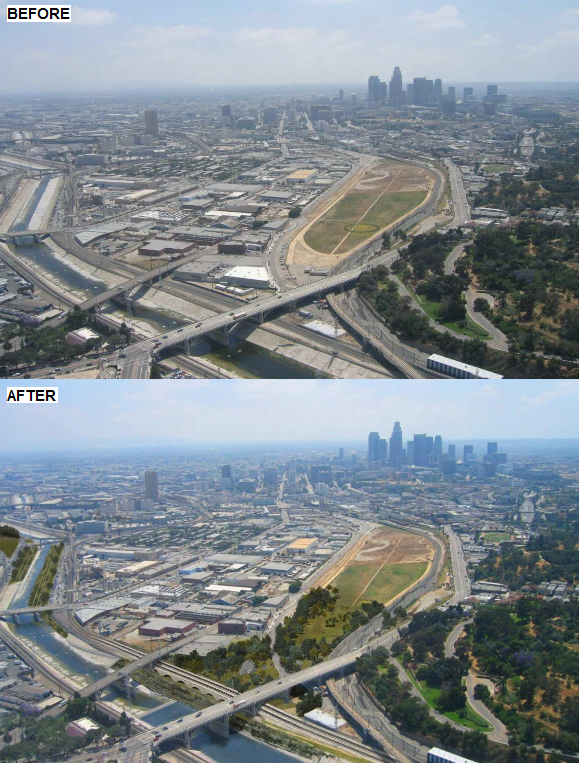 ACE restores a grand total of 588 acres of land from Griffith Park through Downtown Los Angeles. The study divided the river into eight different sections, dubbed "reaches." The reaches studied were Pollywog Park, Bette Davis Park, the Ferraro Fields/Verdugo Wash area, Griffith Park, Riverside Drive, Taylor Yard, the Arroyo Seco/LA State Historic Park, and Piggyback Yard. ACE restores riparian corridors in overbank areas to six of these eight reaches (Pollywog Park, Bette Davis Park, Griffith Park, Riverside Drive, Taylor Yard, and Piggyback Yard). Reach 1 for all alternatives in the final array would implement the habitat corridor with riparian planting on the overbanks. This would restore approximately 60 acres of riparian habitat corridors along the overbanks of both sides of the river....Areas of restoration include Pollywog Park, the banks between Headworks and the River with a connection under SR-134 to Headworks, the open area directly downtstream of Headworks with a connection under Forest Lawn Drive on the same side of SR-134 with Headworks, and on the left bank of the Burbank Western Channel (tributary from the north/west). This would involve planting a riparian community of cottonwood/willow, sycamore, mugwort, mulefat, and scarlet monkeyflower with a buffer of sagebrush, buckwheat and native herbaceous plants. It would include irrigation for establishment and water harvesting features to sustain plants....There would be no channel modifications within this reach. Mugwort, mulefat and scarlet monkeyflower? Those sound like ingredients for Year 1 Potions class at Hogwarts. Implementation of the habitat corridors/riparian planting measure would result in restoration of approximately 26 acres of riparian habitat corridors along the overbanks of both sides of the River as described for Reach 1. This includes restoration of riparian habitat in the Bette Davis Park area of Griffith Park on the left bank and the area between Zoo Drive and SR-134, with connections under the highway to a restored linear riparian planting along the river extending into reach 3. There would be no channel modifications within this reach....This alternative restores 273 acres of valley foothill riparian vegetation and 26 acres of freshwater marsh, and manages invasives on 406 acres, including 182 acres of existing open water. So basically, more plants along the banks of the river. Not exactly game changing stuff for Reach 2, but this is one of the sections of the river that doesn't honestly need too much work. In this reach a side channel would diver water from the river into a side channel flowing on the west side of Ferraro Fields and would daylight a stream currently confined in a large culvert just downstream of Ferraro Fields on the right bank in the Zoo Drive area....The side channel would support a riparian fringe, an open water and freshwater marsh would be located in the daylighted area outside of the mainstem of the River channel. Two additional small streams would be daylighted on the left bank. These would include riparian fringe with freshwater marsh at confluence. Riparian areas would be located on the right or west bank along Zoo Drive, on the River's edge of Ferraro Fields, and between the daylighted streams on the left bank. There would be no modifications to the channel itself. Slight alterations to the river's edge are made towards the bottom left hand corner of the above image. This creates a small marsh and some new streams, but I feel like the proximity to the freeway makes this a less than ideal recreation spot. Restoration in Reach 4 (via implementation of measures to daylight and restore stream geomorphology and habitat in seven areas, a side channel through both the Griffith Park Golf Course on the west and the Los Feliz Golf Course on the east bank, and a riparian habitat corridor) would include approximately 30 acres of restored riparian and wetland habitat. This would be accomplished through diversion of river flow into a side channel up to 10 feet deep with a riparian fringe through Griffith Park on the right bank, lining the left river bank with a riparian corridor within levee regulation requirements, and daylighting approximately seven small streams. I was surprised to see that the golf courses will be staying put. While much of their land is reclaimed as a riparian habitat, the golf courses will be re-designed to work around the new terrain. This reach would continue implementation of the habitat corridor restoration in a narrow strip along the east bank to avoid interference with the existing levee system...and restoration of one daylighted stream area with a riparian fringe and freshwater marsh. The storm drain would be opened and naturalized as a tributary stream as far upstream as possible (at a minimum, this would open up a confluence within the River right-of-way). Depending on the length of the daylighted stream, it would be planted with riparian vegetation and end at the confluence with the river in a small freshwater marsh of approximately 1 acre....Freshwater marsh vegetation would include clustered field sedge, fragrant flatsedge, Parish's spikerush, and common rush, scarlet monkey flower, California bulrush, narrow leaved cattail, and common cattail. Reach 6 in this alternative includes riparian corridors and widening of the soft bottom river bed by over 300 feet with additional slope back to the overbank elevation along the reach length approximately 1,000 feet. At the upstream end of the reach, a back water wetland would be developed on a setback bench and there would be a small terraced area at the downstream end of the Bowtie parcel. Freshwater marsh would dominate the new river bed. The banks of the river would be restructured to support overhanging vines and other vegetation. This is the most substantial aspect of Alternative 13 we've seen thus far, featuring major alterations to the river bed itself. The new green space should be a nice compliment to the adjacent Rio de Los Angeles Park. For some bonus eye candy, here's a close up on Reach 6. In reach 7, the Arroyo Seco tributary would be restored with a riparian habitat. This ephemeral stream would have its banks and bed softened for approximately one half mile upstream and be stabilized with erosion control elements to maintain the existing protection. At the confluence of the upstream edge of the River, a backwater riparian wetland would be established. Within the River channel itself, the banks would be restructured to support vegetation on the banks. This plan connects the river to the park via a small water wheel while adding plants along the banks of the river. While the Army Corps of Engineers appear to be opting against including this design option in their own plans, fear not: independent plans have emerged to build the water wheel, with the project's $10 million cost being assumed by the Annenberg Foundation. The LA State Historic Park is also scheduled to undergo a separate $18 million upgrade next year, adding permanent restrooms, an amphitheater, and a welcome pavilion amongst other amenities. In other words, the above vision may still become reality. Just not through the work of the Army Corps of Engineers. In Reach 8, the Piggyback Yard site would be restored with 113 acres of riparian habitat. Micro-grading would slope the site to restore the historical wash that once ran through this area. The restored historical wash would meander through the property and would be connected to the existing river channel through a wide culvert or designated confluence, if possible. The wash location would be determined by the USACE's hydrology and hydraulic analysis and would be located in the most appropriate place. The riparian corridor measure would involve planting a riparian strip of cottonwood/willow, sycamore, mugwort, mulefat, and scarlet monkeyflower with a buffer of sagebrush, buckwheat, and native herbaceous plants....There would be no channel modifications within this reach as water entering the River from the historical wash would be routed through existing storm drains in the channel wall. This part surprises me. Previous coverage of the LA River restoration gave the impression that reclamation of Piggyback Yard wouldn't happen under. I wonder if Union Pacific is actually willing to part with the land, or if we're going to see messy eminent domain proceedings. The construction of Alternative 13's vision for the Los Angeles River will be completed in four phases, taking an estimated 282 days. Construction will start with Reaches 7 and 8, then make its way up the river towards the project's northern terminus near Griffith Park. It's amazing that such a large and expensive undertaking could be completed in roughly 3/4 of one year. This brings us to the big, uncomfortable question: how are we paying for this? Under Alternative 13, the Federal Government kicks in $139,676,634. This represents the cost estimate for construction of ecosystem restoration. In turn, Los Angeles will have to put forward $313,729,423. The city's share goes toward acquiring the necessary land for the project (i.e. wresting ownership of Piggyback Yard from the Union Pacific Railroad), and then remediation of waste on those areas (Taylor Yard is a known brownfield site). This amounts to a roughly 70/30 split of the project's costs between the Federal Government and the City of Los Angeles. The city's share remains constant through all of the proposed alternatives, since their responsibility is limited to securing and rehabilitating the necessary real estate. The variable for this equestion is how much the Feds are willing to kick in. The Glendale Narrows Riverwalk opened in late 2012. Sunnynook River Park opened early in 2013. A greenway with water features is under construction in Lincoln Heights. A new bridge will traverse the river between Atwater Village and Griffith Park. The 6th Street Viaduct brings an iconic design and more public space. Most importantly, the river was opened for recreation this summer. Of course, the LA River Revitalization is a large, intricate project. A lot of time, effort and political maneuvering will be involved in getting funding Washington. According to the LA Times, we're at least five years away from seeing this project get off the ground. So be patient, and use your imagination until 2018. A look back at our biggest stories from the past year.